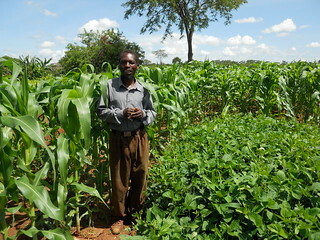 In Zambia, The SIMLEZA-Africa RISING Research and Development project tested a range of improved technologies such as conservation agriculture (CA), soybean agronomy, improved and stress-tolerant germplasm, maize-legume systems, inoculum and improved utilization of legume products with farmers. To help scale-out these technologies, the project revived “mother-baby” trials, a participatory methodology pioneered by CIMMYT over a decade ago to test stress- tolerant maize in Africa and subsequently adapted for diverse agronomic practices. The approach has now been adopted by researchers worldwide. Comprising field experiments grown in farming communities, mother-baby trials feature a centrally-located “mother trial” set up with researchers’ support, supplemented by “baby trials” composed of subsets of the mother-trial treatments that are appealing to farmers. The babies are grown, managed and evaluated by interested farmers, who host them and may talk to fellow farmers, researchers and other visitors about the results. 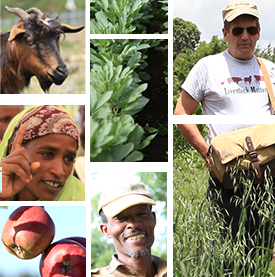 In 2014/2015, the SIMLEZA-Africa RISING project team identified scalable technologies in its project portfolio and encouraged farmers to choose those that could be practiced on their own farms using the mother baby trial approach. 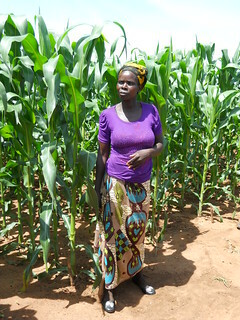 The menu of practices included crop rotations, intercropping, herbicide use and improved drought-tolerant maize varieties. Interest was high amongst farmers, 807 of whom volunteered to grow “baby trials”. Some farmers even extended their plots beyond the designated areas in the excitement of trying something new. First results from the babies were very encouraging as farmers experimented with the technologies on their own farms, got exposed and gained hands-on experience. First out scaling beyond researcher-managed trials created a critical mass of ownership by smallholder farmers. One of the ripple effect of this ownership was demand for technologies that encourage agro-dealers to start stocking critical inputs such as herbicides and/or inoculum. Legume buyers, who usually prefer to buy in bulk were equally impressed by the possibility of finding large quantities of legumes in central locations, which would make their operations more viable. Farmers need a compelling case for technologies that make it easy to change from current practices to improved ones that assure them greater and more sustainable yields while conserving their soil fertility. New technology should have options that are viable in the short and long term in order to be attractive to smallholder farmers. Exposure to new technologies, such as through the Mother and Baby approach used under SIMLEZA-Africa RISING is one way of increasing farmers awareness and getting them involved in improved agricultural techniques. Because the plot size of a baby is small, farmers can easily manage and judge the benefits and decide if this would be worthwhile for them or not. So far the response to widespread exposure of technologies has been overwhelmingly positive. Tags: africa rising, CIMMYT, Conservation agriculture, IITA, Scaling, simleza, zambia. Bookmark the permalink. This is great news…. Africa Rising. On the Inoculum Technologies, are there opportunities to partner on these. Affirm Global is keen on this. We have Inoculate technology tested, developed and Improved for over 30 years. Scalability in Africa. We can share Results on request and partner in this regard.